Just like an unlined jacket doesn't provide much protection from the elements, your stomach can't perform well without a healthy lining. Often the root cause of gastrointestinal discomfort may be a damaged gastric mucosal lining. Help protect it with GastricSoothe from Source Naturals. 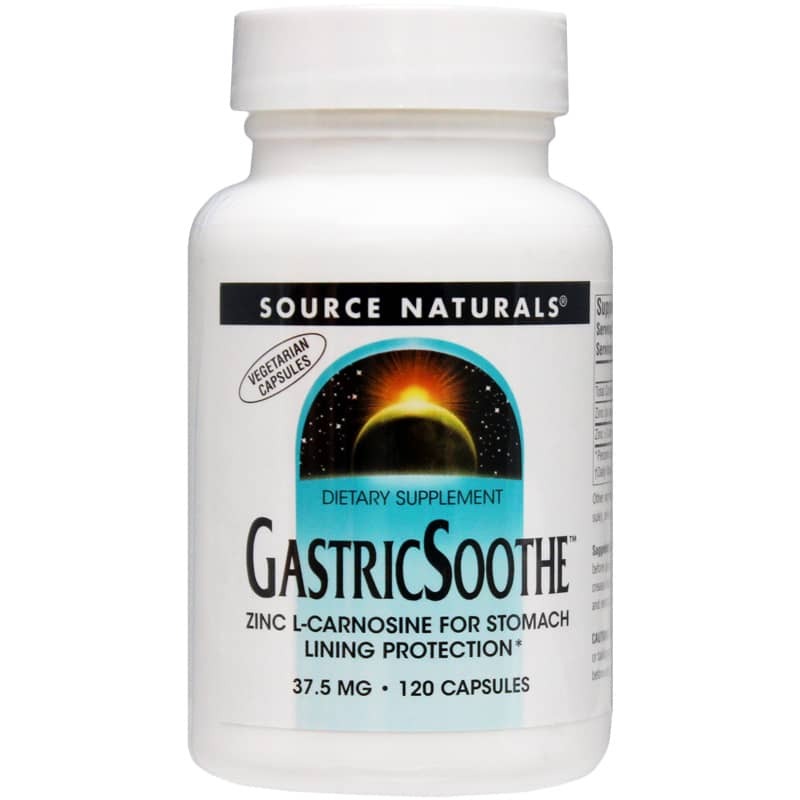 GastricSoothe is a natural supplement containing a compound of zinc and L-carnosine that may help soothe and protect the gastric mucosal lining to help restore gastrointestinal health. The gastric mucosa serves two primary purposes in the digestive system. First, it provides lubrication to help move foods. Secondly, it forms a necessary layer that protects the stomach from its powerful, protein-digesting enzymes. When this layer is in poor health, digestion is impacted and stomach acid can cause discomfort and further damage to the digestive system. Zinc in the form of zinc L-carnosine can help soothe a damaged stomach lining as well as act as an antioxidant to scavenge free radicals and help restore gastric cellular integrity for a protected stomach. For optimal digestibility and to avoid further irritation, GastricSoothe is free of yeast, dairy, egg, gluten, soy, wheat, sugar, starch, salt, preservatives and artificial, flavor or fragrance. It's also suitable for vegetarians. Protect your stomach's lining for less discomfort and better digestion. Order GastricSoothe. 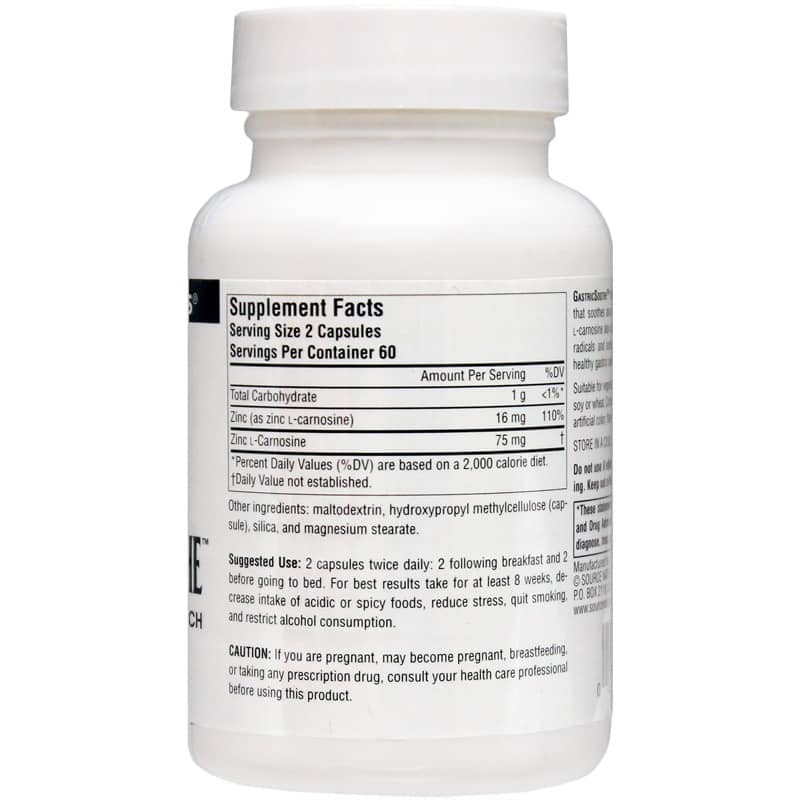 Adults: 2 capsules twice daily: 2 following breakfast and 2 before going to bed. For best results take for at least 8 weeks, decrease intake of acidic or spicy foods, reduce stress, quit smoking, and restrict alcohol consumption. If you are pregnant, may become pregnant, breastfeeding, or taking any prescription drug, consult your healthcare professional before using this product. Do not use if either tamper-evident seal is broken or missing. Keep out of the reach of children. Your product is excellent for my needs.